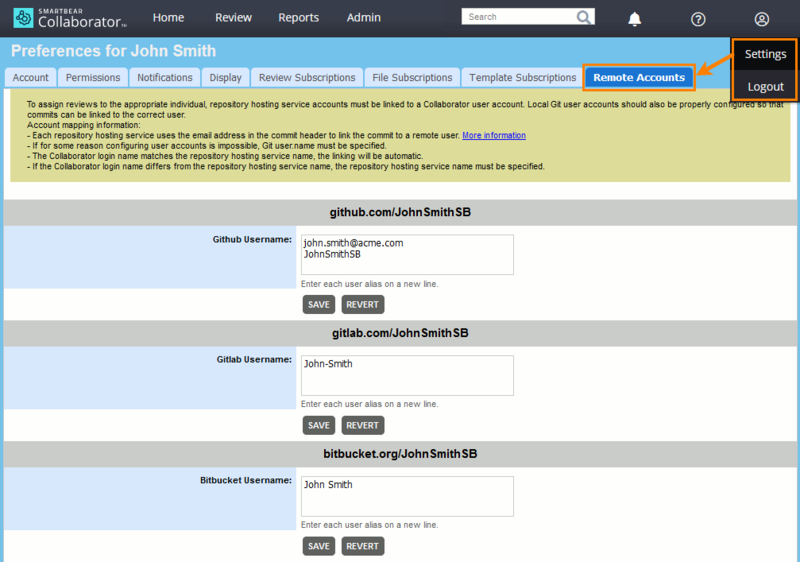 Collaborator automatically creates reviews for changes made to web-based repositories. At that, it can automatically make the person, who is changing files in the repo, an author of the review. The problem is that by default Collaborator has no information about source control accounts. You and your teammates can link source-control accounts with their Collaborator accounts. After that, when creating a new review, Collaborator will be able to find a respective Collaborator user, will make that user the creator of the review and will assign an author role to that use in the review. If Collaborator fails to match the repository user and a Collaborator user, it will make the Collaborator Administrator the creator and author of the new review. Make sure, that you have specified your user name and email address on your local machine (either globally, or for specific repository). To learn how to do this, see Git or Mercurial instructions, respectively. Specify the same user name and email address in your remote repository profile. If the name of a Collaborator user account coincides with the name of a source-control user account, Collaborator will link these two accounts automatically. In Collaborator, go to Settings > and then switch to the Remote Accounts tab. Specify your account names for those web-based repositories, on which you have accounts. For GitLab users: enter your GitLab name exactly as it is specified in the Name field of the Profile GitLab settings (rather than the account name).